Check Payments is a payment gateway that doesn’t require payment to be made online. 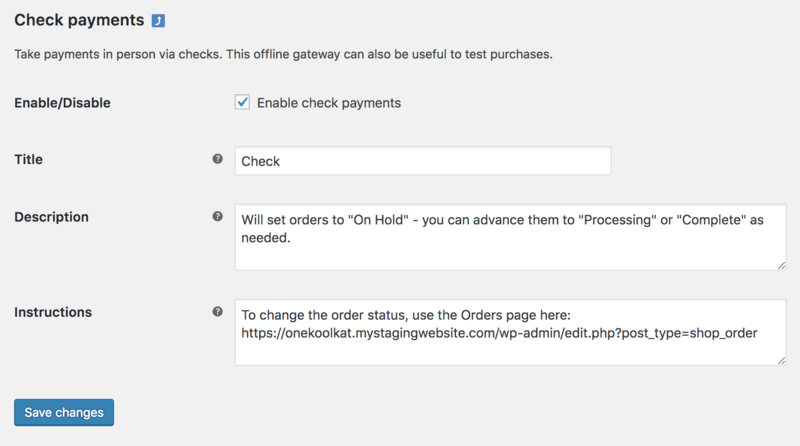 Orders using Check Payments are set On Hold until payment clears outside of WooCommerce. You, as the store owner, should confirm that cheques have cleared before processing orders in WooCommerce. It’s important to verify that you are paid before shipping an order and marking it Complete. For more information, see Managing Orders. Note: Check Payments was formerly called ‘Cheque’ prior to WooCommerce 3.3. Use the toggle under Enabled to select Check Payments. Select Set Up. You are taken to the Check Payments settings.